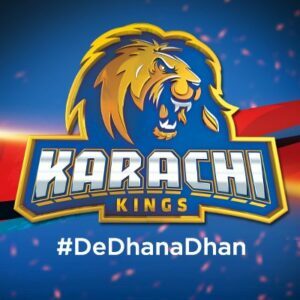 Get Karachi Kings Team Kit, Logo and Official Song for PSL 2019. Pakistan Super League 2019 is being held from 14th February in U.A.E and Pakistan. A total of six teams will participate in it. Karachi Kings represent Karachi city which is the capital city of Sindh. Karachi Kings Team Kit, Logo and official Song is available here. Karachi Kings are showcasing the young Talent from Sindh Province in PSL 2019. Though, the Kings had wonderful seasons previously, but they were unable to claim any trophy in Pakistan Super League. However, this year Karachi Kings are appearing in the PSL with high Morales to win PSL 4 Season. Karachi Kings management has announced the official Team Kit, Logo and Official Song for Karachi Kings in PSL 2019. The official Team Kit for Karachi Kings in PSL 2019 is in blue color. However, the collar of the Karachi Kings team jersey is printed with red color. 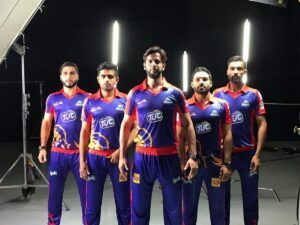 The official team logo of Karachi Kings is displayed on the right side of the kit just above the heart. Whereas, the left side is printed with Cadberry Dairy Milk Logo, which is a chocolate brand in Pakistan. The bottom of the team kit showcases the official logo of Tuc Biscuits. The official Logo of Karachi Kings in PSL 2019 is a yellow Lion with blue border lines sitting on the top of the Karachi Kings Name. The official Song for Karachi Kings in PSL 2019 is ” Niklu Pakistan ki Khatir”. It is a tribute to the Pakistan and it focuses on bringing back the international cricket in Pakistan.